AP PDF to tiff Batch Converter is a useful pdf tool, the converter produces fully functional IMAGE documents with text, pictures, graphics etc, using the original PDF document formatting. It does not need any software support, such as Adobe Acrobat, Acrobat Reader, etc. ...... Such as "1,2,3","2-100" etc,more information,please reference to page range setting . It process the documents one after another, to ensure a output directory for each of them and placing all the finished files of the document into its corresponding directory. 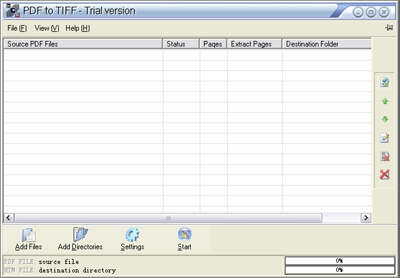 * It quickly convert PDF document to tiff format. * It supports batch PDF to tiff conversion. * It supports encrypted PDF file. * It supports outputting result pages to be customized. * It supports conversion of vector graphics into tiff files. * It supports generate multipage tiff files. * It supports any resolution in the generated tiff files. * It supports conversion into 1bit, 4bits, 8bits,4bits grayscale ,8tits grayscale and 24bits format image. * It supports multifarious compression of tiff image,such as LZW, JPEG,PACKBITS, CCITT Group3,CCITT Group4,RLE etc. * It converts drag and drop of files. Automatically publishes documents to web sites in PDF format. Qweas is providing links to PDF to Tiff SDK/COM(10+threads) Server License 4.5 as a courtesy, and makes no representations regarding PDF to Tiff SDK/COM(10+threads) Server License or any other applications or any information related thereto. Any questions, complaints or claims regarding this application PDF to Tiff SDK/COM(10+threads) Server License 4.5 must be directed to the appropriate software vendor. You may click the publisher link of PDF to Tiff SDK/COM(10+threads) Server License on the top of this page to get more details about the vendor.